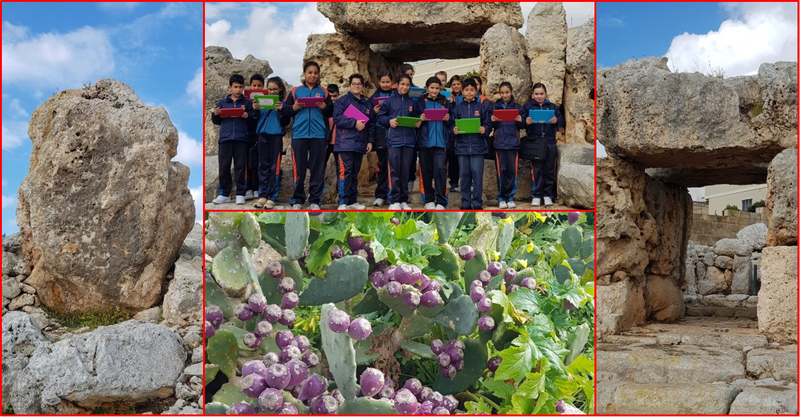 The Year 6.2 students had a fantastic etwinning experience in Gozo between 22nd and 23rd April. The students met their etwinners from San Lawrenz Primary School during this cultural exchange. The programme was jam packed with fun, culture, history and new friendships. The students stayed in Manresa house. On arrive in Gozo they visited the Cittadella, Folklore museum, the Cathedral, silos and battery shelters. 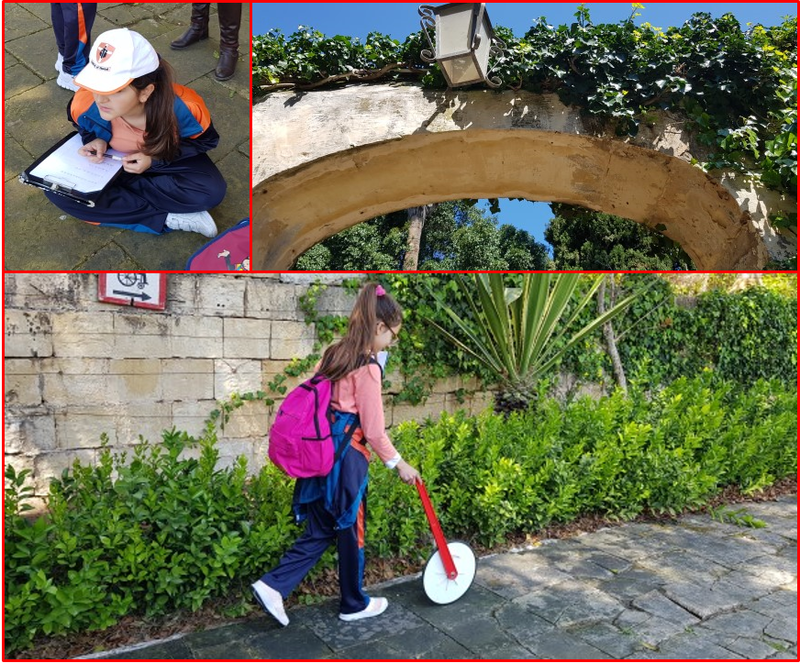 They proceeded to the natural history museum and the Ċitadella Visitors’ Centre where they saw a captivating documentary about Gozitan History. Afer they visited the dry moat, narrow streets in Il Manderaggio, saw an exhibition of Good Friday Statues, Don Bosco Oratory and the cemetery of the Crusades. Finally they visited Lunzjata Valley and its chapel built on a cliff side. Before retreating for the day, they had supper at House Manresa. After supper the students went to Ta Marziena and enjoyed Munxar’s open gym, then proceeded towards Sannat passing through Ġnien is-Sultan before going back to the dormitories. On the second day the students visited Ġgantija Temples, Ta’ Kola Windmill, Xerri’s Grotto (famous for its stalactites and stalagmites), Ta’ Karmni’s Museum and finally off to Dwejra where student enjoyed a wonderful boat ride, corals, cliffs and deep blue waters. 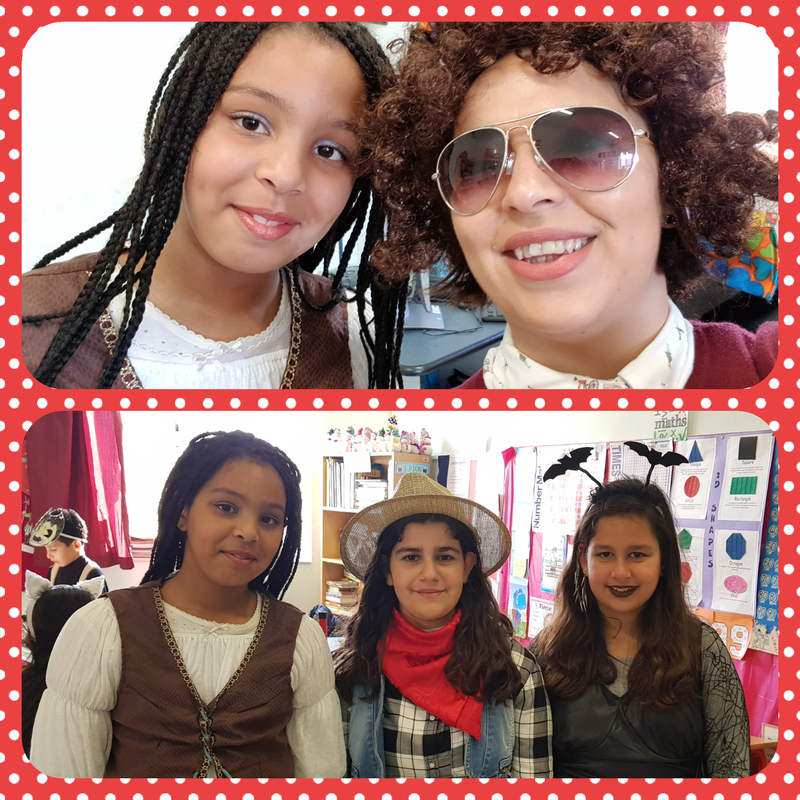 This entry was posted in Year 6 and tagged eTwinning on 24 April, 2019 by mgarrprimary. The Year 6.2 students are preparing a puppet show as part of their literacy week. Students can be seen working on the script and props. The puppet show will be presented to the kindergarten students shortly. 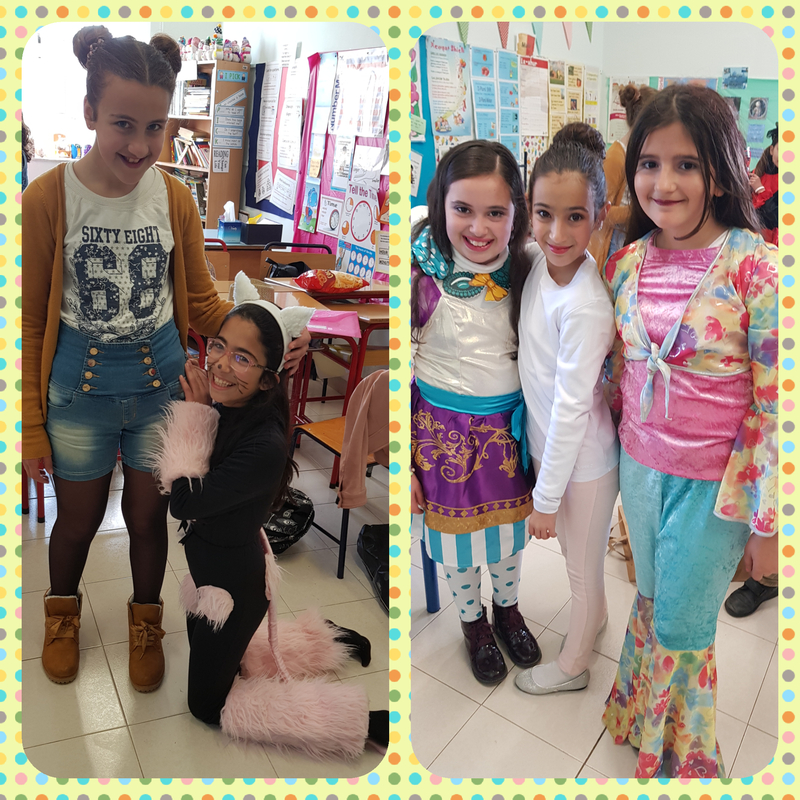 This entry was posted in Year 6 and tagged literacy day, puppet show on 16 April, 2019 by mgarrprimary. A pleasant morning adorned with the spring sun, spent counting, calculating, measuring and discussing. A busy morning indeed! 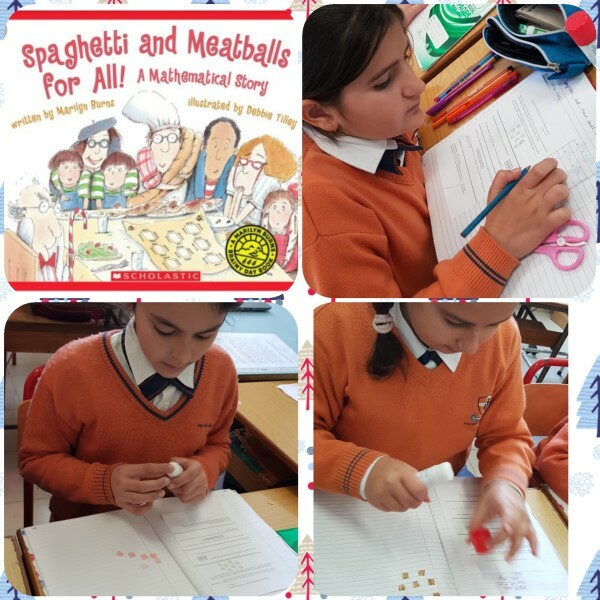 Making maths fun through hands-on! 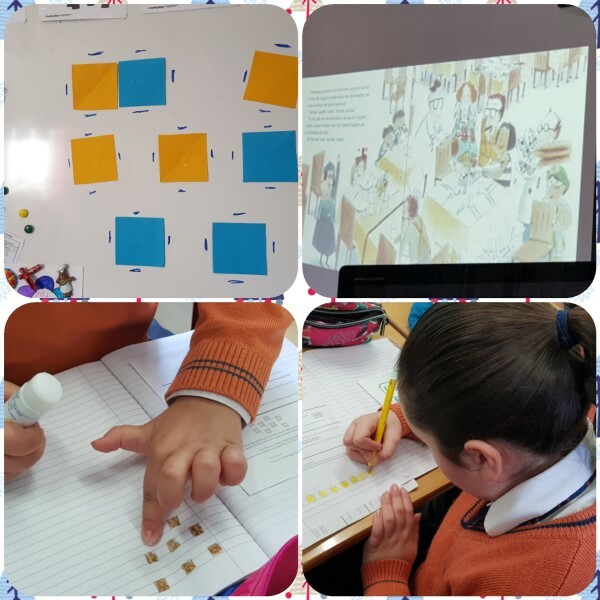 This entry was posted in Year 6 and tagged maths trail, San Anton on 29 March, 2019 by mgarrprimary. First- an explanation was done to help students remember how to convert l to ml and vice versa. An investigation was then carried out by myself using measuring containers and students were asked to observe the different questioning techniques. 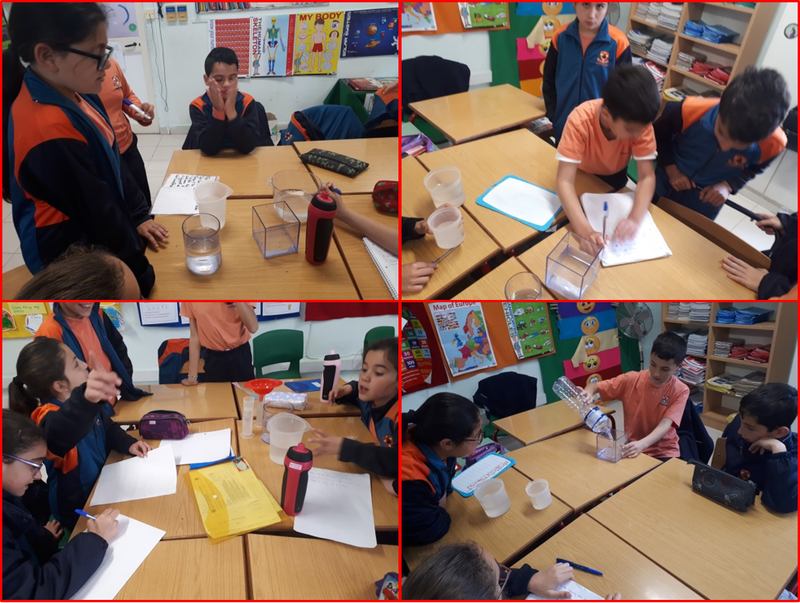 Then, using measuring containers in groups, the students were given the opportunity to create their own investigation using liquids while emphasizing the concept of liters and milliliters. 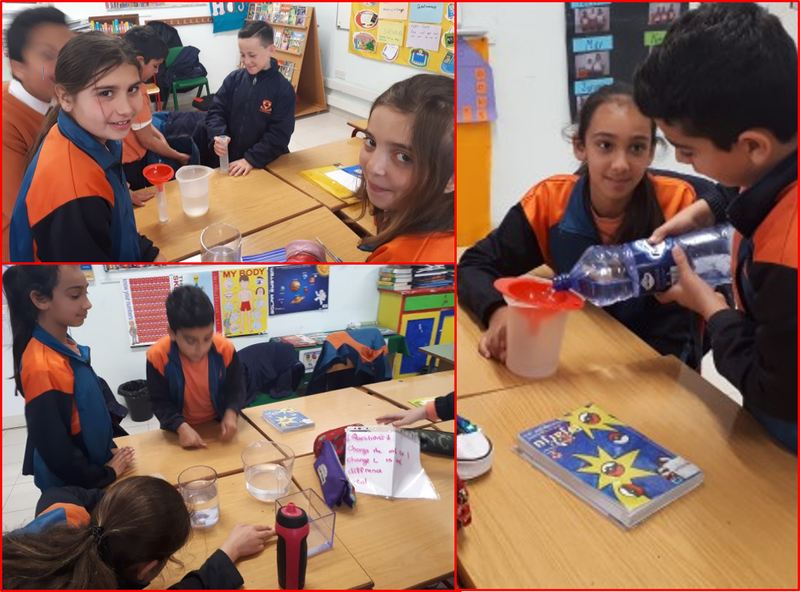 After creating their problems and using the necessary amounts of water in the containers, they went around and solved the investigations that the other groups had laid out for them in stations. This entry was posted in Year 6 and tagged capacity, maths on 27 March, 2019 by mgarrprimary. Learing about ‘Time’ using the CPA (concrete, practical, abstract) approach. 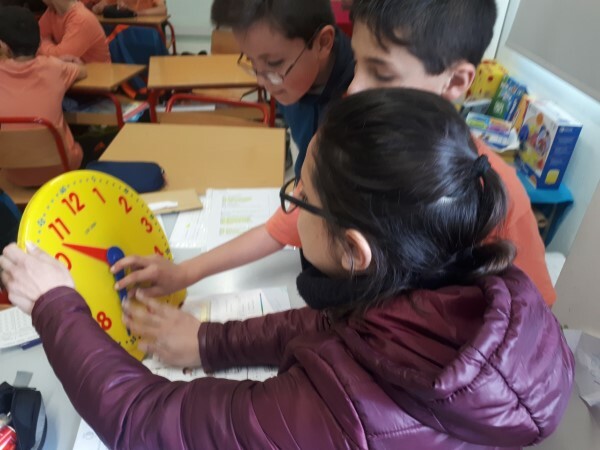 Clocks from the Maths Class Toolbox were used as a tangible resource to help students understand the 24 hour clock better. A tablet game with pictures of clocks on it was then used as a consolidation of the previous explanation. A memory game was carried out in groups where students were asked to match the 24 hour clock time with the 12 hour clock time. This entry was posted in Year 6 and tagged maths, time on 15 March, 2019 by mgarrprimary. 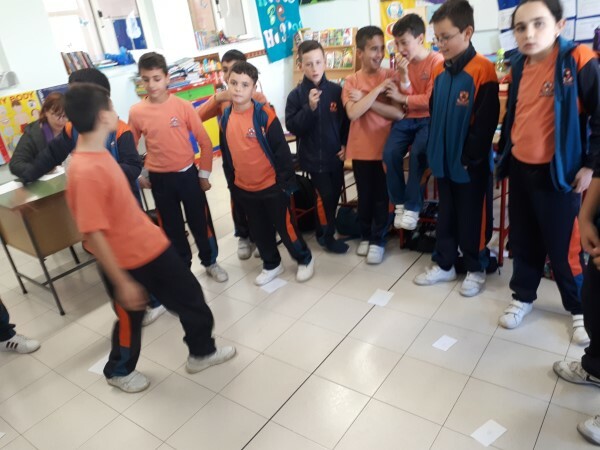 Students enjoyed a Maths game. 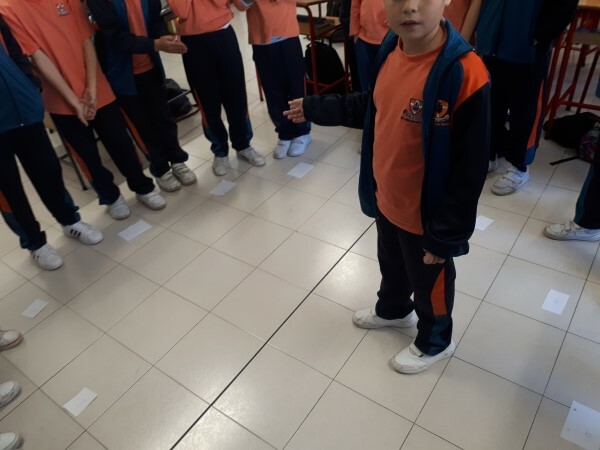 Flashcards of numbers from 1 to 12 were placed in the middle of the classroom to represent the clock. The students acted as the clock hand and were given instructions by the others to face a number. They were then given instructions with right angles or degrees to turn either clockwise or anticlockwise (e.g. Turn 120° or 1 2/3 right angles) and if they faced the correct number, their group was awarded points. This game helped a lot since the students themselves became an involved part of the activity and were put in the ‘middle’ of the lesson. A Quizizz activity on the tablets was then carried after as a consolidation of the lesson. This entry was posted in Year 6 and tagged maths, right angle on 6 March, 2019 by mgarrprimary. 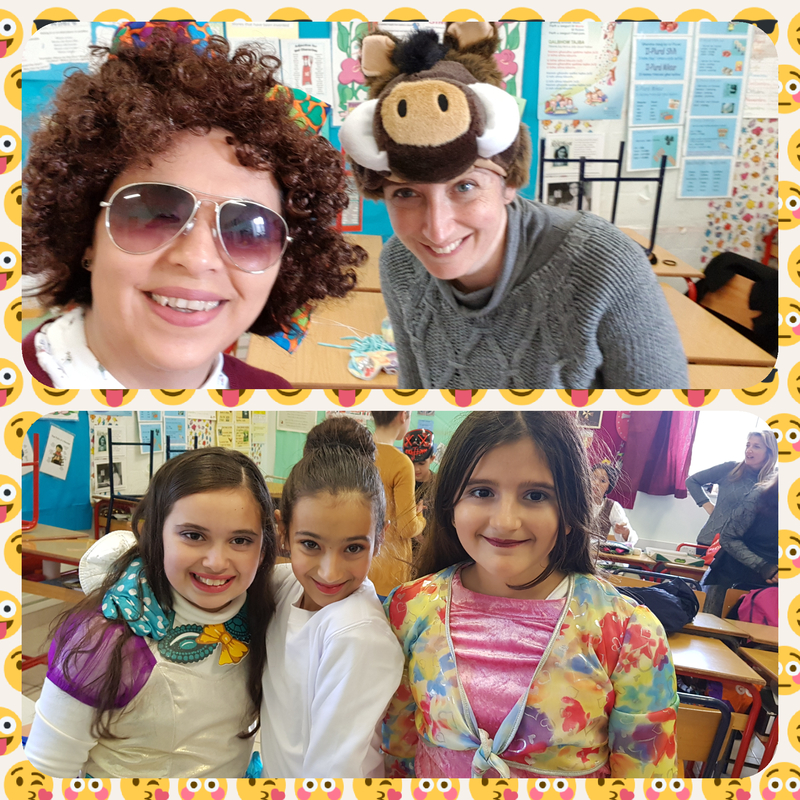 Jgħajjtu x-xjuħ, u jgħajjtu t-tfal, viva l-jiem tal-karnival!! 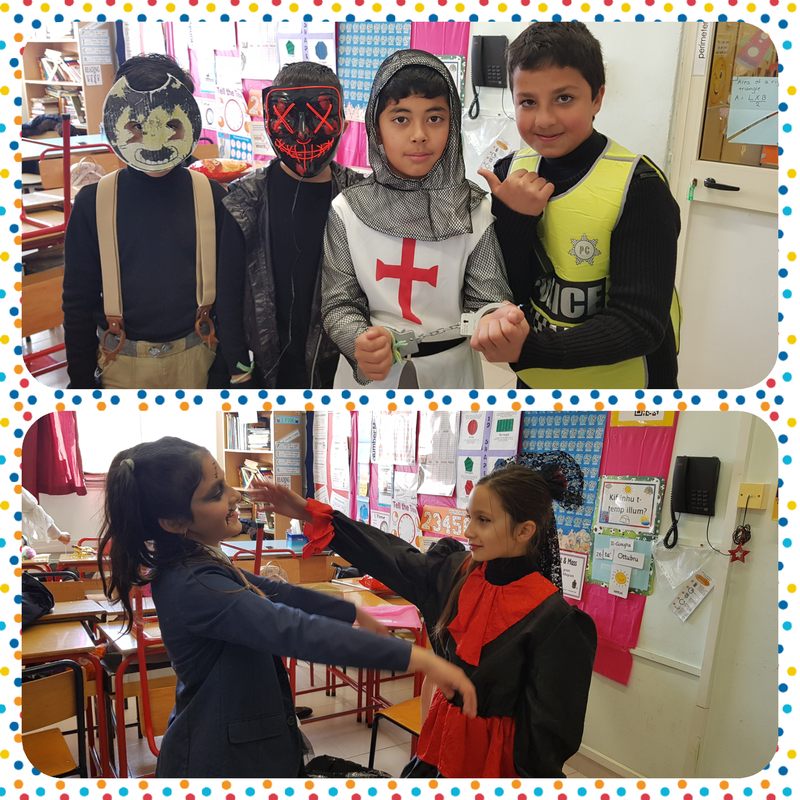 This entry was posted in Year 6 and tagged car nival on 2 March, 2019 by mgarrprimary. 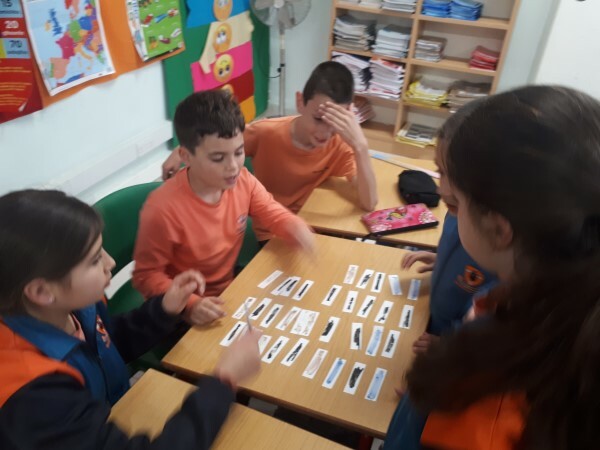 The Year 6.2 students are participating in an eTwinning project with students from San Lawrenz, Gozo. 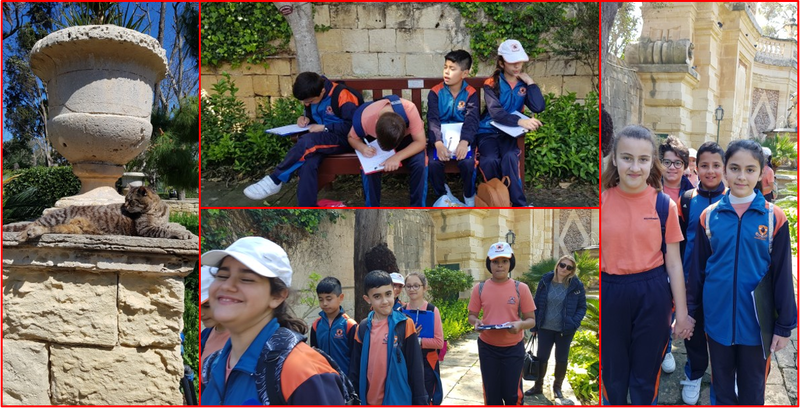 An activity was carried out with Ms Laura Schembri, the digital literacy support teacher this morning, at Ta Ħaġrat Temples. The students used their tablets and QR codes to find clues and information about these temples. It was great fun and the children participated eagerly. 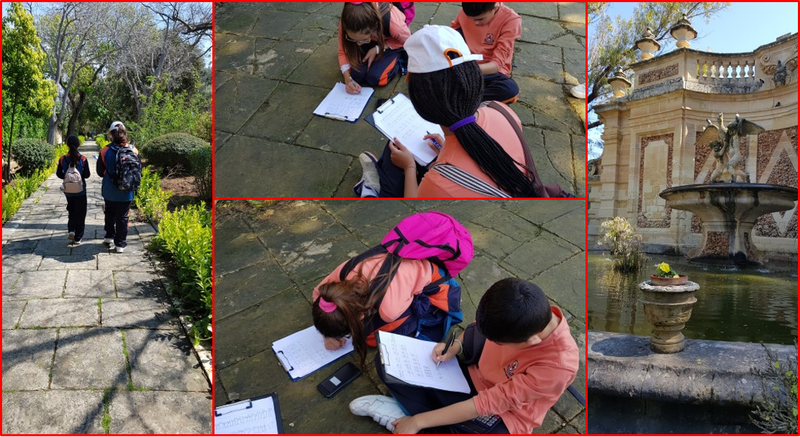 This entry was posted in Year 6 and tagged eTwinning, Hagrat temples on 26 February, 2019 by mgarrprimary. Education is not just learning the core subjects. Students learn from different experiences. 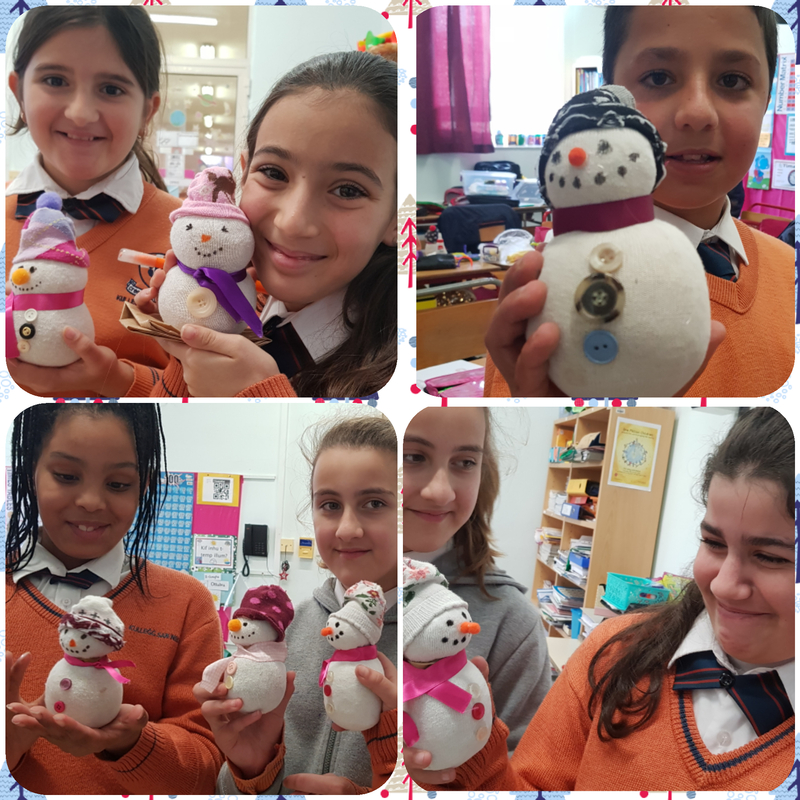 Craft activity whereby Year 6.2 made some adorable snowmen using socks, bits of ribbon and buttons! Aren’t they cute?! 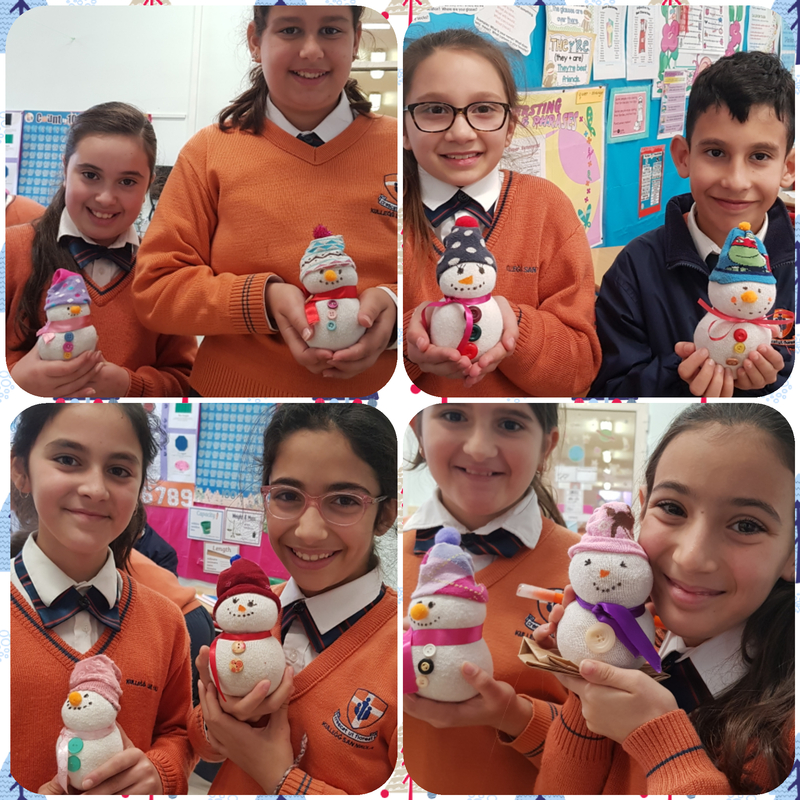 This entry was posted in Year 6 and tagged craft, snowman on 9 February, 2019 by mgarrprimary. The story is about The Comforts inviting 32 people for lunch. We see Mrs Comfort hiring 8 square tables to seat 4 at each table. However, as the guests begin to arrive and they start putting the tables together so that they sit together, we see that although the area remains the same, the perimeter doesn’t! We practiced the seating with square cut-cut-outs for a whole class activity and discussion. Later we used square bits of paper to recreate different ways of arranging the tables on our Maths Journal. After that we progressed to draw different combinations of using the same area but different perimeter. We also applied this to real life situations as seen in restaurants and big family gatherings. This entry was posted in Year 6 and tagged area, maths, perimeter on 4 February, 2019 by mgarrprimary.